This episode starts with bang. A one-on-one, knock 'em down and drag 'em out throwdown with Kelly seeking out Ruby. Kelly blasts holes in Ruby with a shotgun, of course this just really annoys Ruby. Kelly has brought with her the Kandarian dagger, in a bid to end Ruby once and for all. Things don't quite go as planned and Kelly implements plan B - A hand grenade. Meanwhile, Ash and Brandy have hightailed it back to Ash's house, where they have a small moment before Brandy wants to wash the demon off her. Ash answers a kick on the door and guess who? It is four more of the Knights of Samaria, Ash of course can't roll his eyes enough at their kneeling and the whole boring story. Ash tells the Knights about their buddy in his hardware store basement and shows them the pages of Necronomicon and mentions the writing on the walls. 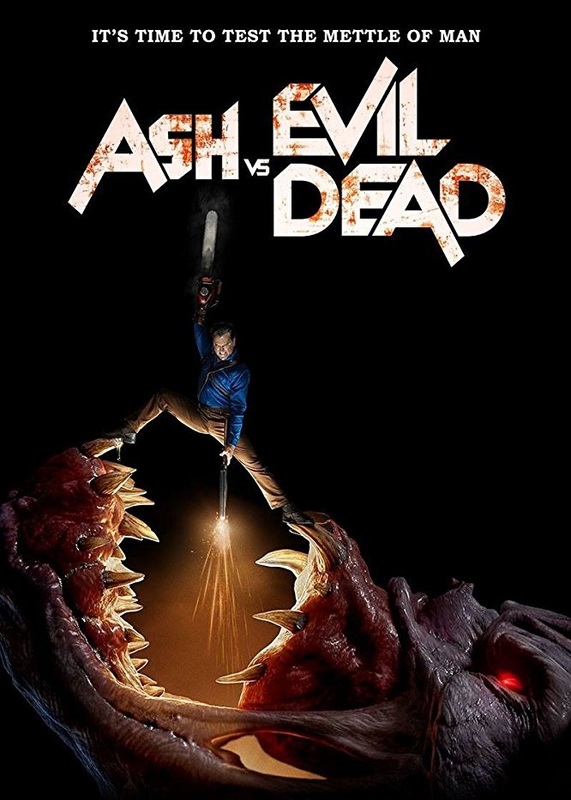 It's agreed that Ash and Knights will go to the hardware store and see if they can stop the evil, forever. The Knights tell Ash of Ruby's plan, however there is only one problem - they don't have the Book Of The Dead. The Knights think that they can get the Dead Lands and formulate a plan. Pablo is sorting through his box of Brujo stuff, when his new powers kick in and alert him to some new danger that Ash is in and he takes off for the hardware store. 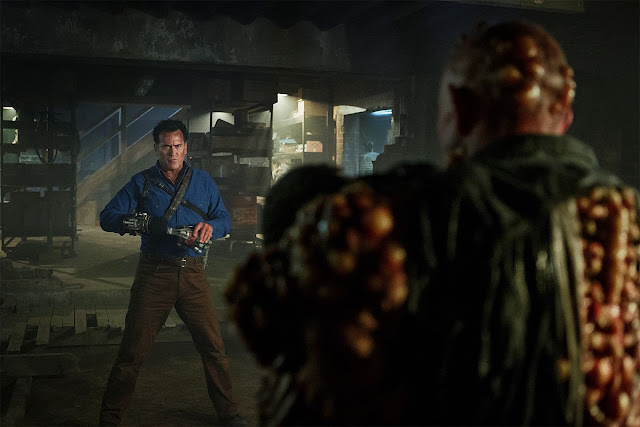 At the hardware store the Knights tell Ash that the writing on the wall is a way to open the rift - as Ash (in a great call back to the end of Evil Dead II) recalls 'I've been in rifts before and it never ends well'. The Knights want to enter the rift to battle evil in the Dead Lands. Pablo arrives and uses his Brujo powers to open the rift - much to Ash's chagrin. 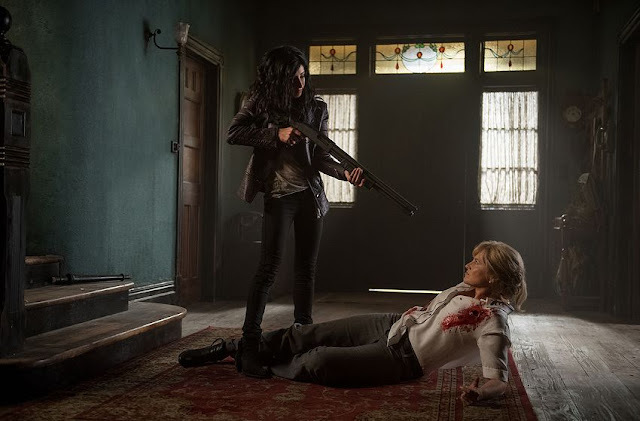 Kelly continues her fight with Ruby, culminating in... Kelly's death. Ruby stabs Kelly with the Kandarian dagger and Kelly dies. With Kelly dead, Ruby has a perfect opportunity to use her body as a vessel for Kaya to enter and escape from the book and the two conspire to turn Brandy against Ash. Another really good episode, with probably the best fight scene that AvED has ever had in Kelly Vs Ruby. It was brutal and even has some emotional clout toward the end of the fight. Pablo has started using his powers and I really like it. I think that he will have some really cool stuff to do in the upcoming eps. I am also keen to find out just how the Kaya / Ruby dynamic works, I have a feeling that one of them will be betrayed by the other.